I think that I may have had too much white wine the evening before as I had woken through the night with a ragging headache; I had to dose myself up with paracetamol and for most of the morning I felt very sluggish. This drinking thing is really not worth it but for some reason I keep going back whenever we are in company. Why? 0530 MrJ and I leave McGowan’s, following Tryphena out. 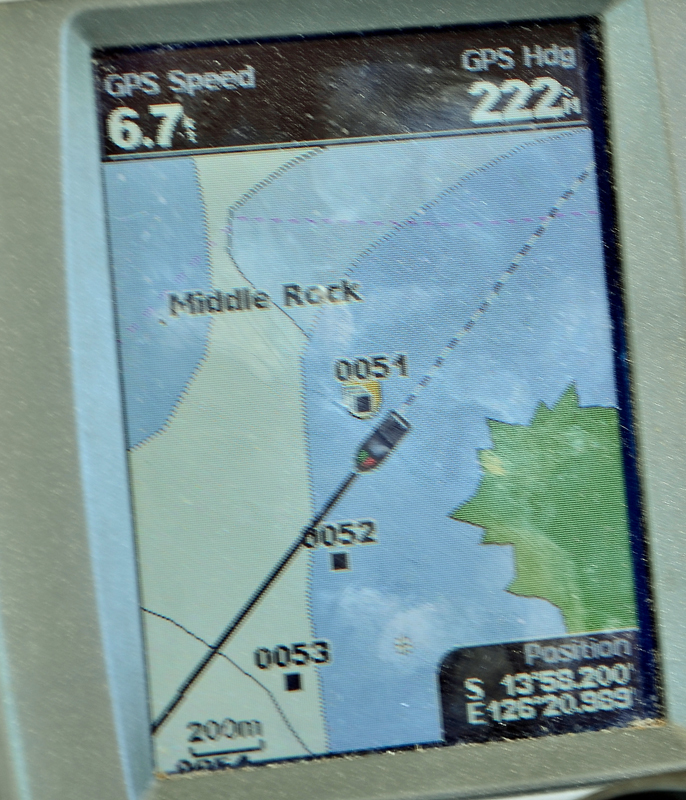 We were going against the tide to be able to catch the tide through the very narrow channel between Mary Island, the mainland and Middle Rock and then down into Vansittart to Jar Island. On the way out of Napier Broome Bay MrJ hooks a small shark on the trolling line which he let go and then there was nothing else. No fish this day! Going through the narrow channel at Middle Rock was a bit hairy as most of the information and chart plotter are out as far as any calculation are concerned and the paper chart are not magnified enough to be of much use. 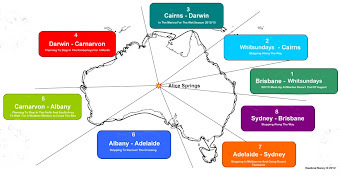 John off Murrundi had given us some waypoints and Peter off Tryphena had another waypoint to be used. These MrJ put into our chart plotter and I marked them on my computer charts, a program called Open CPN. And then the narrow passage which had some magnificent rock outcrop jutting out of the water all around, was a breeze with fairly calm water as we had the tide going with us and not wind. 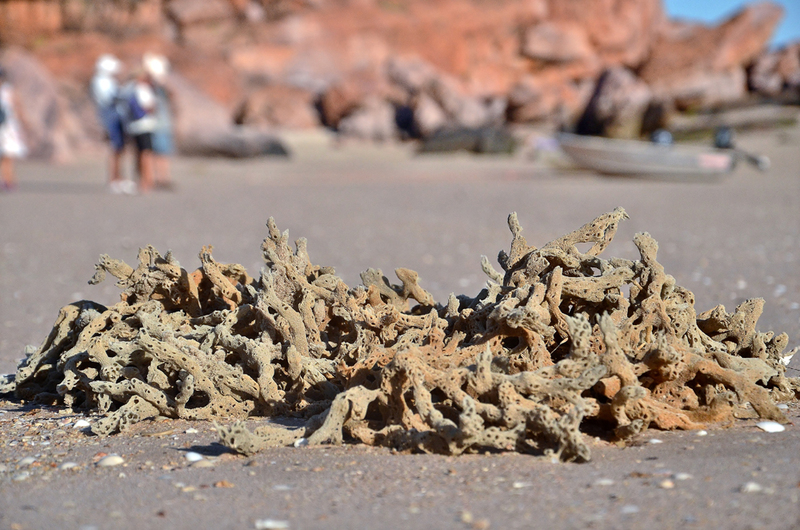 The western side of Vansittart Bay is full of pearl leases that belong to Pasparley of Darwin. We had to follow close to the outside of the pearl strings to get to the top of Jar Island which sits at the bottom of the bay. It was not too long before Murrundi arrived and then there were three. The day we anchored off Jar Island with the other boats Tryphena and Murrundi was the same afternoon that we all went ashore in search of the famous Bradshaw Rock Paintings known to the local Aborigines as Gwion, Gwion or Allarwhro. 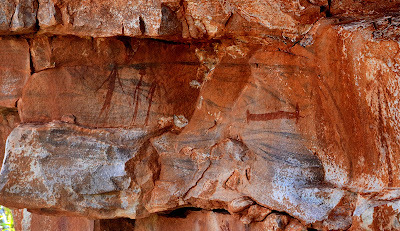 The Gwion, Gwion or Bradshaw Paintings are incredibly sophisticated examples of rock art found predominantly in the Mitchell Plateau and Gibb River sections of Kimberley region of Western Australia. 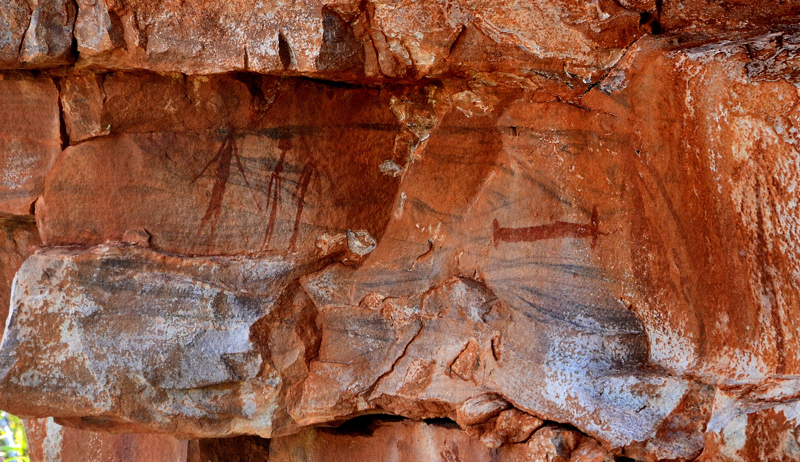 This art form was first recorded and named after Joseph Bradshaw, the first European person to record art of this kind in 1891 when he was lost on an expedition through the Kimberley with his brother. Bradshaw published an illustrated account of his findings in 1892 ('Notes on a Recent Trip to Prince Regent River'). Of them, Bradshaw said, "The most remarkable fact in connection with these drawings is that wherever a profile face is shown, the features are of a most pronounced aquiline (eagle-like) type, quite different from those of any native we encountered." In 1938 Doctor Andreas Lommel, a member of the Frobenius Institute, lived for several months in the Outback of north-west Australia in the Kimberley, with the Unambal tribe, with the aim of copying Aboriginal rock paintings. On his second expedition to the Kimberley in 1955, he was joined by his wife Katharina. 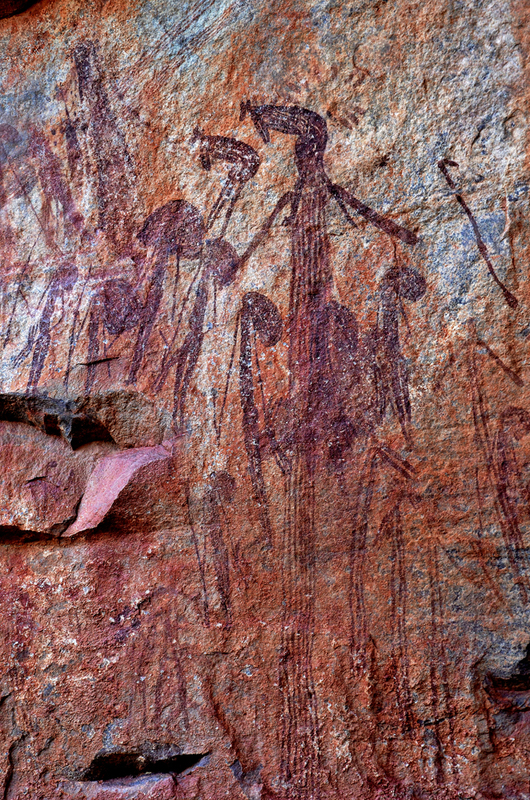 After that expedition, Dr. Lommel stated his belief that the rock art he referred to as and is now commonly identified as the Bradshaw Paintings may well predate the present Aborigines. 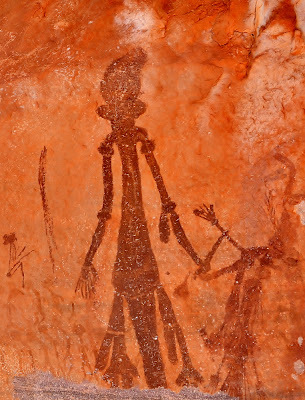 Since the initial find by the Bradshaw brothers, over 1,000 paintings have been discovered. 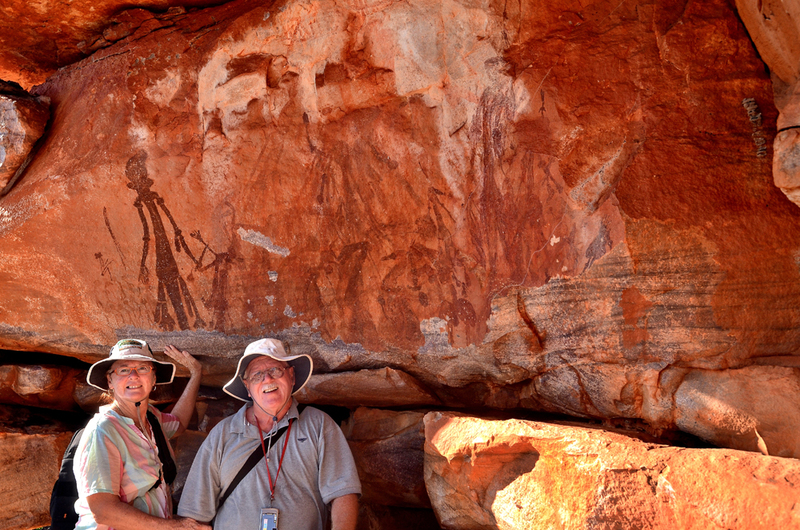 The painting sites extend in an area of about 50,000 square kilometres. 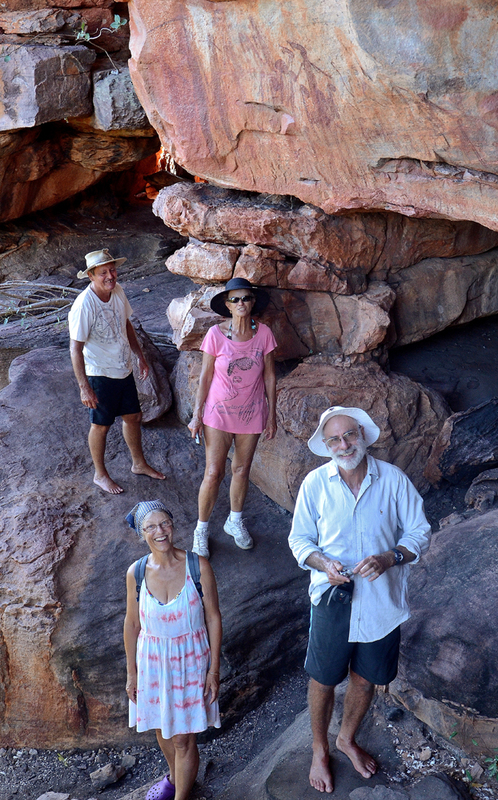 Based on aerial photography and field visits, an additional 10,000 to 50,000 vaults of Bradshaw Galleries are likely to exist in the Kimberley ranges. The figures are found in raised small caves at cliff faces of substantially horizontal bedding, and in the protection of overhanging rock ledges. Each painted site offers magnificent views of the rugged landscape. Many pictures were painted on the ceiling; the artist lying on the back, as Michelangelo did to paint his frescos. The Bradshaw Galleries cluster along and adjacent to the seven river systems of Kimberley Ranges, with concentrations around rocky river flats, which were certainly covered by large alluvial deposits during the glacial periods. The art is of such antiquity that no pigment remains on the rock surface, thus it is impossible to use carbon dating technology. The composition of the original paints cannot be determined, and whatever pigments were used have been amazingly locked into the rock itself as shades of Mulberry red, and have become impervious to the elements. In saying that the rock images are hard to date; it is believed they were created at least 17,000 years ago with some theories indicating they could be even older, potentially up to over 50,000 years ago when humans first explored this continent. 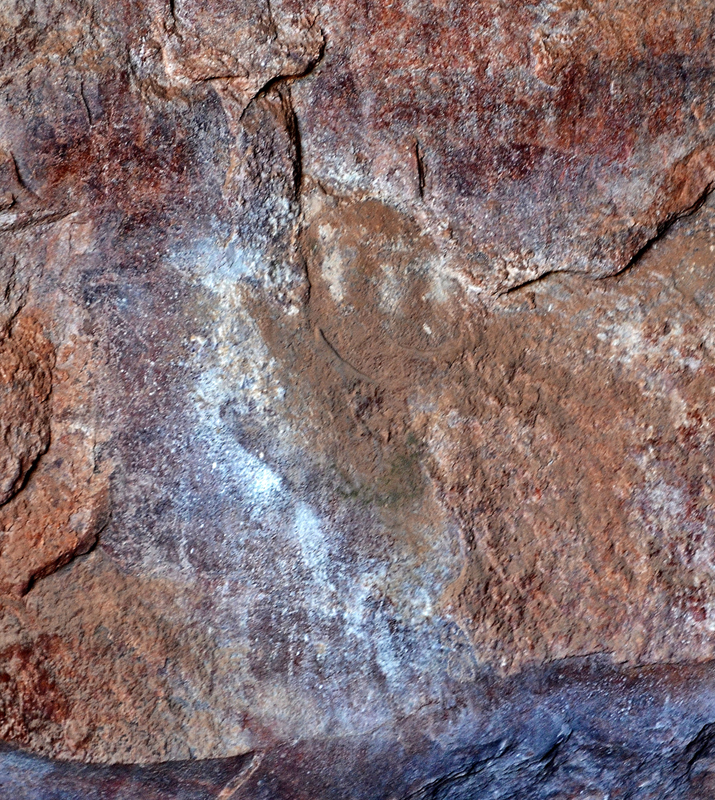 If this is the case, the images are possibly the oldest known to man. Over the last two decades Grahame Walsh has explored the inhospitable environment of the Kimberley Region of Western Australia, mainly on foot, and has discovered thousands of these magnificent Bradshaw Paintings. Only by fortune, in 1996 Walsh discovered a Bradshaw Painting partly covered by a fossilised Mud Wasp nest, which scientists have removed and analysed using a new technique of dating, determining it to be 17,000 plus years old. Our little expedition consisting of six people came ashore on the SW beach of Jar Island securing out tinnies on long lines as we knew that the tide was still going out. It had been a look where you go kinda ride to avoid all the rocks in the bay. 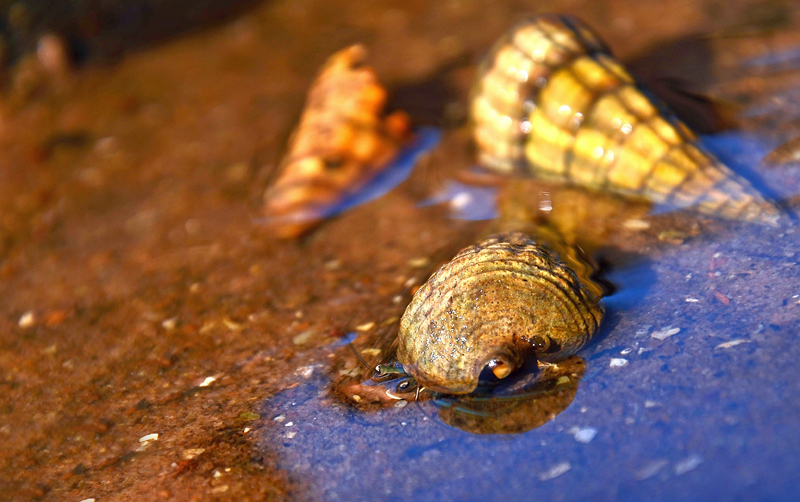 The expedition then trudged across the low sand hill to a small lagoon whose water had receded with the outgoing tide. This was where the timing of our land was important as not to be wading in knee deep water to get across the lagoon whether going or coming back. Walking across the mud base of the lagoon we had to be very careful of out foot placements as there were a multitude of hermit crabs wriggling around in the wet mud. 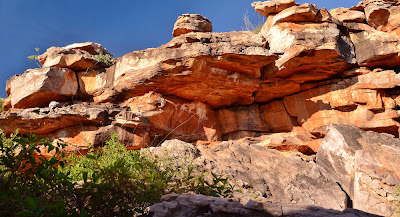 Once across this minefield of crabs it was a scramble through and over large sandstone rocks till we came to an overhanging rock ledge some 12mts above the ground. Around the underhanging rock face walls and inside a small cave we found many Gwion, Gwion paintings that were in excellent condition, having been protected from the ravages of the elements. 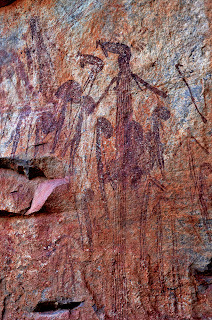 The majority of these small rock paintings were of human figures with agile, sinuous bodies, stick-like in character, adorned with elaborate hair style and body ornamentation. 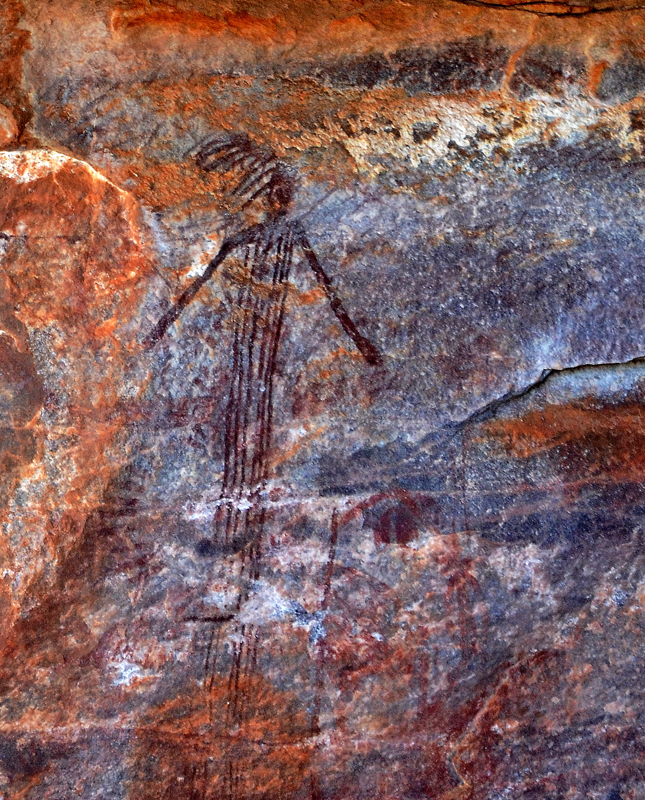 There were also a couple of paintings that represented animals and/or part animal part human. 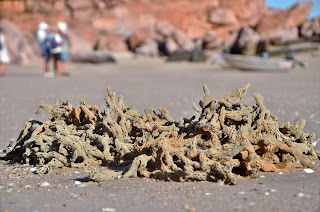 To get to some of these rock paintings we had to crawl through narrow passages in the rock shelf and there were live mud wasp’s nest there. Scary! The view back out to sea from this art site was magnificent and it was not hard to imagine what it must have been like back in the Gwion, Gwion days all those thousands of years ago when the land in the form of lush valleys was out there instead of water. That evening MrJ and I had the other cruisers over for sundowner. Peter and Shannon have a small property near Coffs Harbour and have been mucking around in boats for twenty years. They had cruised up the east coast last year to leave their boat in Darwin while they went home back to Coffs Harbour over the wet season. John and Barbara are based out of the Sunshine Coast in QLD and are live-a-boards like MrJ and I. 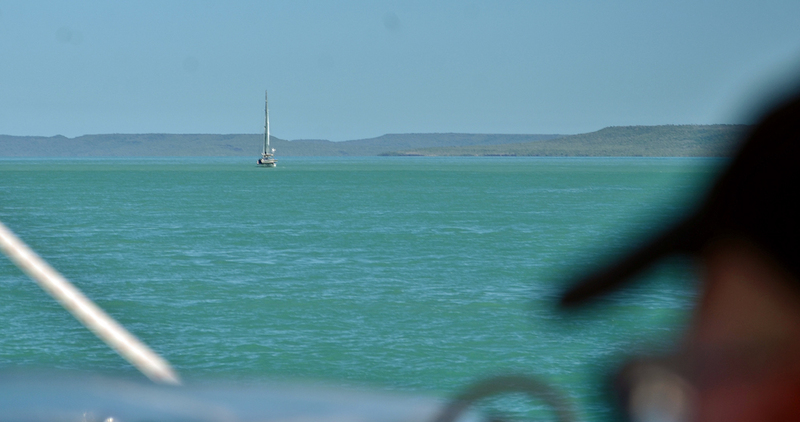 They had also stayed in Darwin over the last wet season, staying in the Tipperary Marina. John and Barbara love their fishing.